Will Bitcoin Industry Regulation Happen Soon? It has been over a year since I last gave y’all an update on bitcoin so for those of you who are interested in cryptocurrencies, here’s a rundown of what’s going on in the industry these days. Towards the end of 2016 and in the first few weeks of this year, Chinese officials have been ramping up their crackdown on bitcoin activity in the mainland in an effort to curb offshore investment and speculative yuan positioning. You see, the government wanted investors to put more funds in local stock markets and assets instead of seeking higher returns elsewhere. In the middle of all these, the top bitcoin platforms in China began announcing higher transactions costs on bitcoin trades and ceasing margin account offerings on cryptocurrencies. Later on, exchanges temporarily halted withdrawals for bitcoin trading clients to cooperate with ongoing investigations on money laundering activity that might have been conducted using digital currencies. Last week, an official from the Chinese central bank was quoted saying that they need to provide clarity on bitcoin regulation and supervision. The PBoC Director himself warned that some platforms are faking volume to attract investment and that price bubbles will be amplified without regulations. For now, the “Big Three” of bitcoin exchanges in China (Huobi, OKCoin, and BTCC) which account for 98% of bitcoin volumes in the world are still waiting for the government’s go-signal to resume bitcoin withdrawals. Last Friday, while most forex traders were sitting on the edge of their seats for the NFP report, bitcoin junkies were biting their nails for a completely different reason. That was the same day that the SEC was scheduled to announce their decision on the bitcoin ETF created by the Cameron and Tyler Winklevoss (Yes, the “Winklevi” as popularized by “The Social Network”) that would potentially make the cryptocurrency more accessible to individual and institutional investors. Unfortunately for the Winklevi and bitcoin fanatics, the U.S. regulator ruled that the largely unregulated nature of the cryptocurrency in other markets where it is also traded opens up a huge possibility for fraud and manipulation. The SEC also noted that the national securities exchange needs to design rules to prevent fraudulent practices in order to protect the investing public. In a statement, the Winklevoss twins said that they will continue to work with the regulator to bring their idea to fruition. Even with all the jitters stemming from the Chinese markets and the prospect of increased bitcoin regulation, the cryptocurrency still managed to hold its head above the $1100 mark and keep up its longer-term uptrend. After all, this alternative investment does manage to attract funds from investors seeking high returns even in a risk-off market environment that usually dampens gains for more traditional assets like stocks, currencies, and commodities. If you’ve been keeping track of bitcoin movements over the past couple of years, you’d probably remember that the Greek debt crisis part XXVII in early 2015 led to a strong boost in price when capital controls were imposed in the country. This led the Greeks and other European citizens to put funds in the cryptocurrency for use in daily spending activity, investment, and even as some form of insurance in case the shared currency ceases to exist. This time around, there have been no such signs of panic just yet but political headlines have been keeping a lot of uncertainty in play in the European region. For one, Euroscepticism is a huge theme in upcoming elections in the Netherlands and in France, and the looming Brexit and potential Scottish independence also poses additional risks. 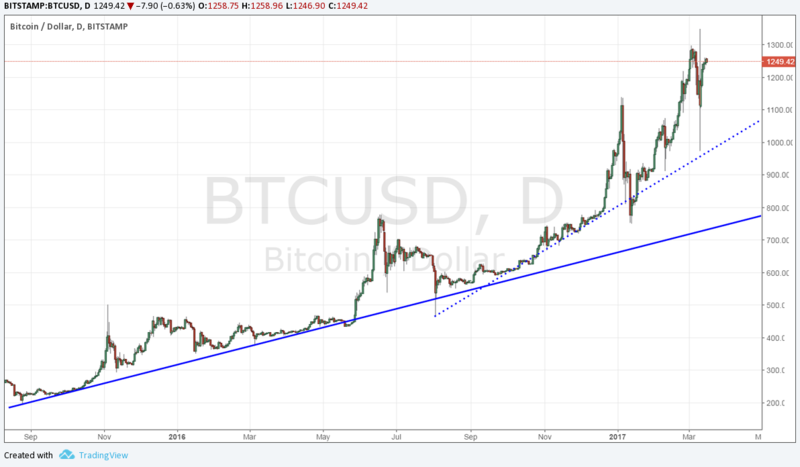 In terms of price action, the rising trend line since Q3 2015 remains very much intact and bitcoin has even embarked on a steeper climb since Q3 2016. Volatility is still in place, as those sharp dips in January were spurred by bitcoin crackdown updates in China, but bulls seem to be putting up a good fight.